The wildflowers are in their full glory following all the rain we’ve experienced this Spring. There is one plant to be wary and avoid contact. The stinging nettle is abundant this year in shade and part-shade areas reaching 2-3 feet in height. Long pants might be a good idea as they’ve been seen on several of the trails including Malacoda in the Purgatory Creek Natural Area. According to the Lady Bird Johnson Wildflower center Stinging Nettle or Urtica dioica L is “A 4-angled stem, covered with many bristly, stinging hairs, has slender, branching, feathery clusters of minute greenish flowers in the leaf axils. Flowers are unisexual, with either male or female on a given plant, or on same plant with males in upper leaf axils, females lower. Highly irritating to the skin, this Nettle should not be handled. However, the very young shoots and top leaves may be cooked and served as greens or used in soups and stews. The family and genus names come from the Latin uro (meaning “I burn”). And it does burn! On-line research reveals the properties of the hairy fibers contain three chemicals one of which is a histamine which in some people can raise welts. Treatment includes any anti-itch creams and lotions. Wikihow.com suggests aloe vera or a baking soda paste. The plants are also beneficial as larval food for the Red Admiral and Question Mark butterflies. The nettle is also used as a tea and a medicine. 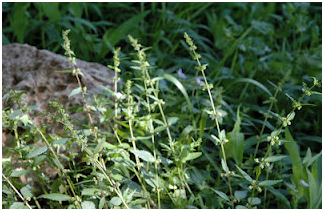 There are even “fun facts” about the stinging nettle plant at www.thenaturalremedies.com/allergy-stingingnettles.html. Can you believe the English even have a nettle eating contest? According to Wikipedia, in Dorset, England thousands come to watch the competition. Who said nature is dull?